Cake originally made for the Princess in May 2006. I'm going to tell you now, I don't have pictures of the process since I made this cake almost six years ago. 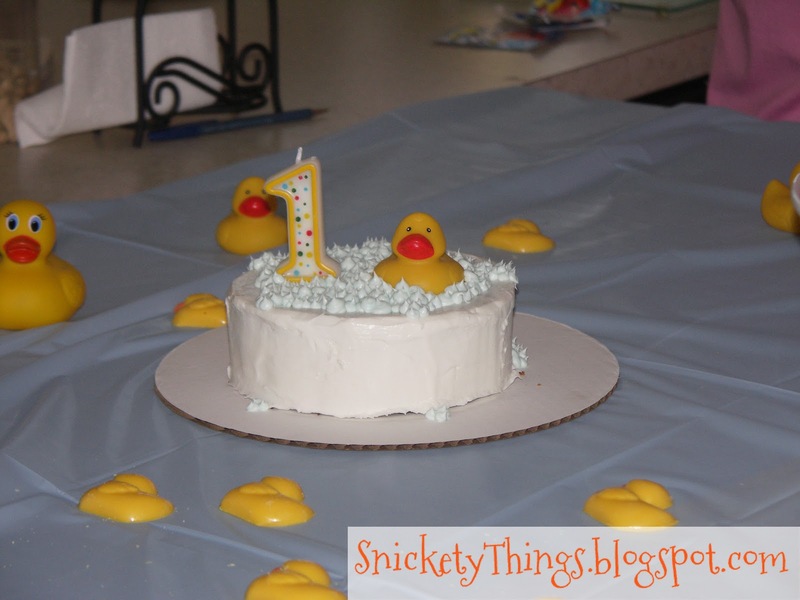 When my oldest daughter turned one, I knew I wanted to do something really special. I wanted her to have the perfect little cake, but I didn't have the money to spend on a specialty cake from a bakery. I scoured the internet for a theme for her party. 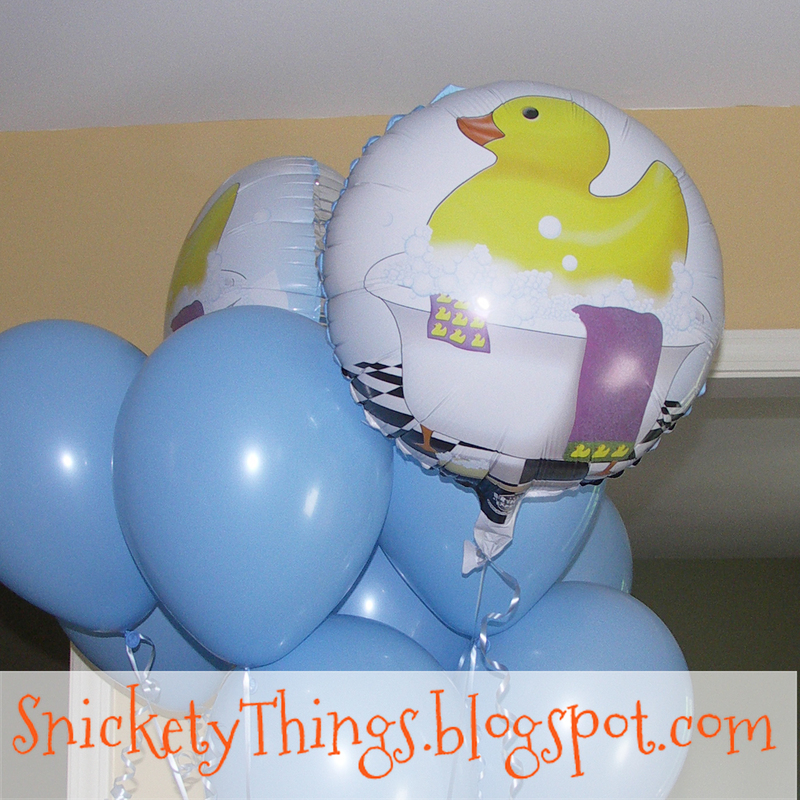 I settled on a rubber duck theme from Celebrate Express. They no longer carry it, but they have a lot of cute themes and I have used them more than once. 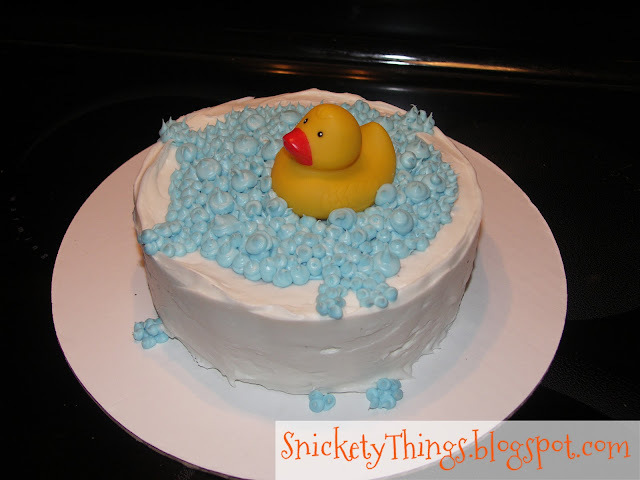 With absolutely no experience in making and decorating a birthday cake, I decided I wanted to do a cake actually shaped like a duck. 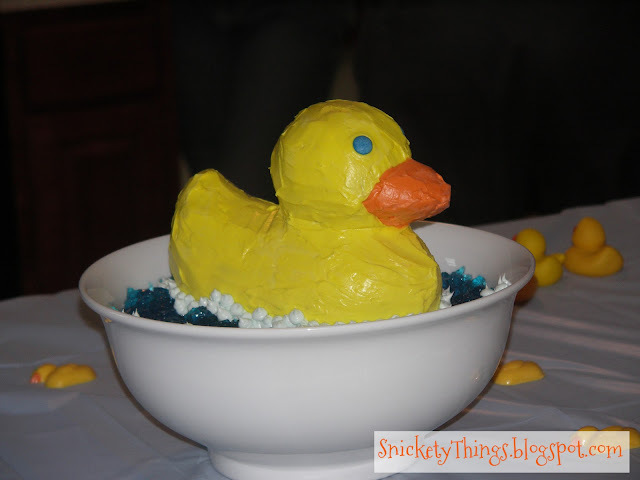 Not only shaped like a duck, but sitting in a little tub with water and bubbles, just like the picture. I tell you, I dream big. Luckily, Wilton has a duck shaped pan so I snapped one up. Score! I was also able to find a white bowl at Target that looked a lot like the tub in the inspiration piece. Score again! Sort of. 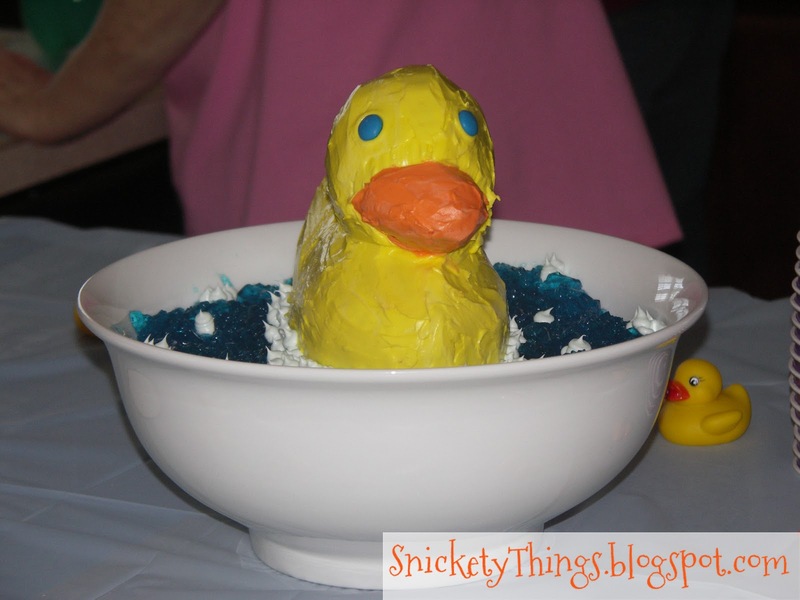 The bowl was pretty deep so I had to figure out how to make the duck sit high enough for it to be seen. I settled on a cake round that just fit a couple of inches into the bowl. I supported it with so styrofoam I had cut into chunks from some packaging we had. I planned on using blue jello for water so I put a piece of plastic wrap over the board and up the sides of the bowl a little. Enough to keep anything from being able to slip down the crack between the cake round and the side of the bowl, and to keep the cake round from getting soggy. After all, it had to support a duck still. This sounds like I was moving right along with the cake, right? Nope, all of this took me a few days to figure out. The cake itself was an adventure. It baked easily enough in Wilton's pan and I got it settled into the bowl. I had bought a few cans of frosting, tinted some yellow and some orange, and went to town icing it with a butter knife. Yep, you heard me, a butter knife. Looking back, I am surprised it turned out as well as it did. I used blue M&Ms for the eyes. I didn't stop there. All first birthdays need a smash cake, right? I thought I would try to make one of those, too. I used a six inch round pan to make a cake for the tub. I iced it white and piped little bubbles all over it. I wasn't daring enough to wait until her birthday to try it so I made a practice cake a few weeks before. And the final cake, with lighter bubbles. 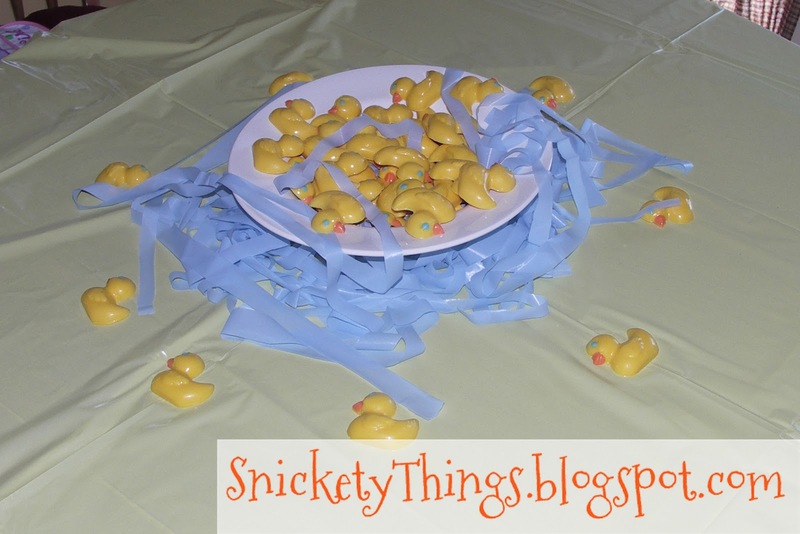 I got a bit wild and made little candy ducks to match the cake. If you have a question on how I made something, just ask! I love them all! Great job on the cakes. Have you tried to beat that cake since? I think you set the standard pretty high with that one! Thank you Amy! I've been trying to get better with each cake. Every Wednesday I am trying to post some of the cakes I have made. You let me know if they are up to par. I always try to let me kids decide what their cake will be to give them as much of a choice as possible. That cake turned out awesome for someone who had no experience at the time! I love how you made a "smash cake" as well.